After reviewing the 2019 Honda HR-V Sport trim, we came away loving the excellent fuel efficiency, magic-folding rear seats, and massive cargo space. But what about power? 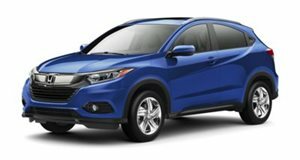 In the United States, the only engine option for the HR-V is a 2.0-liter four-cylinder producing 141 horsepower and 127 lb-ft of torque. Honda used to offer a six-speed manual transmission on base models but a CVT is the only option for 2019. Looking around at the sub-compact crossover segment, there are very few options with turbocharged engines outside of the Hyundai Kona and the recently-refreshed Kia Soul. Both of the Korean SUVs are powered by a 1.6-liter turbocharged four-cylinder producing 175 hp and 201 hp respectively, mated to a seven-speed dual clutch transmission. The Ford EcoSport has a turbocharged three-cylinder option as well, though it displaces just 1.0-liter and produces only 123 hp. Aside from the Kona and the Soul (and the far more expensive Mini Countryman), no other automaker sells a semi-performance-oriented sub-compact crossover. Since the HR-V is one of the most well-engineered vehicles in the segment, we see this as an enormous opportunity for Honda. At the end of 2018, Honda revealed a new version of the HR-V called the HR-V Sport (not to be confused with the Sport trim in the US). This new version of the HR-V ditches the 2.0-liter normally-aspirated four in favor of the 1.5-liter turbocharged unit from the Civic. With its new turbocharged heart, the HR-V Sport produces a healthy 180 hp and up to 177 lb-ft of torque. The sprint to 60 mph takes 7.8 seconds, compared tp the 8.6 seconds taken by the base car (9.5 seconds if you opt for AWD). Honda even sells the HR-V Sport with an optional manual transmission in addition to the CVT. Offering this car in the US sounds like a no-brainer for Honda - slap some 'Si' badges on it, probably kill the manual option (because the US hates manuals), and get ready to sell a heap of them in the US. The only issue? Honda hasn't announced any plans to offer this engine in the HR-V for the US market. We've taken a look around the sub-compact crossover segment and we think Honda would be silly not to offer a more powerful version of the HR-V in the US. Although we doubt the manual would make the voyage from Europe, that 1.5-liter turbo mill seems like the perfect addition to the HR-V lineup. If you agree with us, we suggest you send in you send Honda a friendly email asking why it doesn't love you as much as it loves Europe.